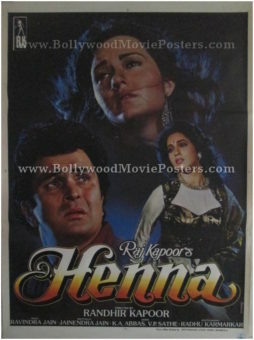 Classic Bollywood poster for sale of the hit Hindi film Henna (1991). This is an actual surviving classic Bollywood movie poster for sale of the 1991 Hindi film that was directed by Randhir Kapoor starring his brother Rishi Kapoor, Ashwini Bhave and Pakistani actress Zeba Bakhtiyar. Henna was planned and started by the greatest showman of Indian cinema, Raj Kapoor. However, due to his sudden demise during the filming stages of Henna, the remaining portions were directed by his son Randhir Kapoor. Henna is therefore considered as the last film of Raj Kapoor, making this classic Bollywood movie poster highly collectible! Henna was both a critical as well as a commercial success and was also India’s submission for the Academy Award for Best Foreign Language Film (but was not accepted as a nominee). Designed by the greatest calendar artist in India, JP Singhal, this classic Bollywood poster bears his printed signature in the name of his studio “Singhals” on the bottom right hand corner. Pakistani actress Zeba Bakhtiyar is seen in a stunning photographic still prominently on the top of this classic Bollywood poster. Rishi Kapoor and Ashwini Bhave are seen in smaller stills at the bottom.